Just a quick, casual look today after a fun-filled weekend! Things to look forward to this week: prepping for an amazing V-day shoot, a giveaway you're not going to want to miss and of course, a lot more fashion. Also, don't forget to enter the giveaway below! I LOVE THIS! 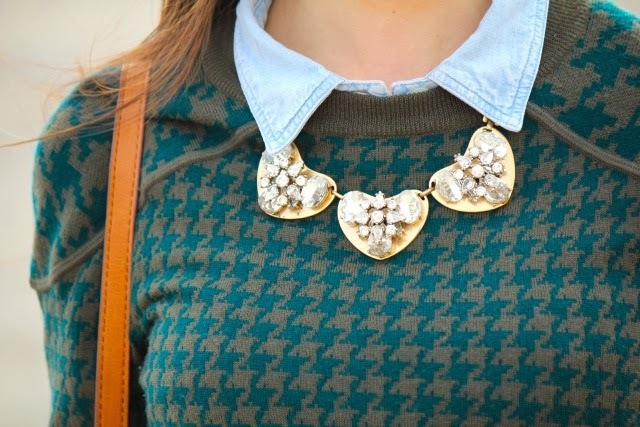 i need chambray in my closet for sure! Love this combo...your hair is so pretty! I cut mine a couple months ago, it's past my shoulders, but short to me and I am dying for my long locks back! LOL. Pretty! That necklace is so gorgeous! This might be one of my favorite looks of yours EVER! Obsessed! Such a chic look! I love your sunglasses! Super cute outfit. Love the sweater. Love the color combo! Thanks for the inspiration! Love this look! I really need to get a chambray shirt!! Love that rich green color, beautiful look. Great outfit! Love your hair! Your pictures are lovely, and so is that necklace! in love with this necklace megan!